Reach Paradise: What Are We So Afraid Of? Just about every survey result on people's greatest fears will list "death" in the top three. Usually, its numero uno. I thought about that a lot this week, especially coming off last weekend's Gospel (Mk 13:24-32). Death, and the End of Time, are always described so ominously. It's no wonder just the thought of it worries us. Imagine if we got to interview someone who had passed away and gone to Heaven. When asked what Heaven is like, I imagine they would tell us that Heaven is perfect. It is a place of beauty. A place of joy. There are no tears, no crying, no anxiety, and no pain. Angels rejoice. Love is abundant. Peace is overflowing. In short, it is Paradise. But when asked what Earth was like, in retrospect, they might tell us it is a place of sin, anxiety, and sorrow. A place where there is little harmony, and even less peace. A place where there is far from enough prayer, love and honor. A place where people kill each other, born and unborn out of spite, fear, hatred, and greed. And a place where people worry about possessions more often than they worry about serving the Lord. So, what exactly were you so afraid of again? I have been present at the deaths of two family members, both of them passed away peacefully after receiving the Sacraments, and I think I can say that I don't fear death. I fear, perhaps, that I am not doing enough to assure myself a place in heaven, or that I haven't done enough penance or suffered enough on earth to mitigate my Purgatory. Thank you both for commenting! I agree 100% with both of you ... I am not afraid of death per se, but deathly afraid of not doing enough to get to Heaven. This post was intended to be more about death itself, and the fear of leaving Earthly things behind. But, as you have both pointed out, death has more layers than that. That's a good question! I guess many people are afraid of the actual dying process and leaving loved ones. Heaven is certianly something to look forward to! I would have to agree that the fear is death is irrational. St. John Vianney said, "Our home is in heaven and our stay on earth is like staying in a hotel. You always want to go home." The fear of not getting to heaven is real and should be stressed more. The other problem is with the statement, "NOT DOING ENOUGH TO GET TO HEAVEN" We can never do enough to gt to heaven. If acheiving heaven was based on our works, we would never get there. The ONLY way to get to heaven is through the life, death, and resurrection of Jesus Christ. 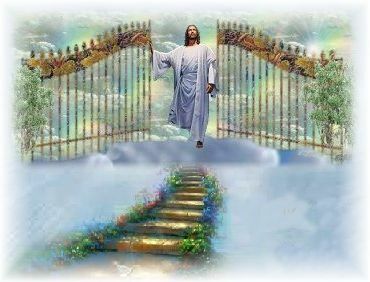 If we get to the pearly gates and God asks you why should I let you knto heaven, the only correct anwer is "Because Jesus, Your Son, died for me." Any other answer is Pelagianism. God will however ask us to prove that we love Jesus. Still, no one will be denied the fullness of happiness when in heaven. The only question is what will be the capacity of our souls if we get there. St. Dismas and Bl. Theresa of Calcutta are both in heaven. Connie - It certainly is! Thank you for stopping by my blog! I always pray for a peaceful death,but being a human, I think about leaving my family behind. For instance, my dad has been ill for many years, fighting cancer off and on, and I think he is not ready to leave my mom and the rest of us yet. For me, on the other hand,I would have to say that I would be afraid of not being worthy enough to enter the gates of heaven, not the death itself. Thank God for His being so merciful! Good food for thought. I like this post. Good morning Michael. Thank you for another great post. I guess I am blessed in the sense that I am not afraid of death....only the process of dying. I heard Pat Boon on a talk show years ago and it helped to take away my fears. He said as new borns we struggle because we don't want to be born. We are afraid to leave the womb but then we come into this beautiful world where hopefully we are loved and taken care of. When we die we go through a similiar struggle because we don't want to leave this world but hopefully we will be going to a place so much more beautiful and special than this one. Like you say we will be going to paradise. I hope you have a lovely day.